The Torque is set to hit the streets sometime "this spring," and pricing should be announced "this quarter." For more information on the Torque, have a look at the full press release below, check out Kyocera's Torque landing page, or head over to The Now Network's site. OVERLAND PARK, Kan. (BUSINESS WIRE), January 28, 2013 - Water, dirt, drops – there seem to be 101 ways to break or damage smartphones that dutifully serve as mini computers, schedulers and entertainment devices. Today, Sprint (NYSE:S) and Kyocera Communications Inc. announce the upcoming availability of Kyocera Torque, built to survive extreme elements and everyday life. Torque will be available this spring; exact availability and pricing will be announced this quarter. 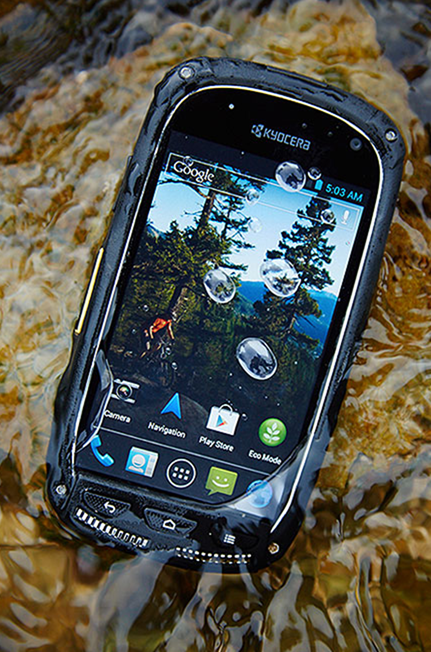 Torque is an ultra-rugged, 4G LTE Android™ smartphone featuring Sprint® Direct Connect® push-to-talk service and Kyocera’s award-winning Smart Sonic Receiver audio technology. Torque is built to Military Standard 810G (MilSpec) to withstand dust, shock, vibration, solar radiation, humidity, blowing rain, low pressure, salt fog and extreme temperatures, along with IP67 standards for dust, sprayed water and full immersion up to one meter deep for up to 30 minutes. The device is specifically designed to hold up to the rigors of today’s rough-and-tumble lifestyles – whether on a construction site, beach trip or a kids’ playground – without sacrificing style and features. Dropped 26 times from four feet high – or, the average week with kids at the playground. Heavy dust for six hours – going off the grid while off-roading and camping will never be harder. Exposure to salt fog for a complete 48 hour cycle; this cycle included 24 hours exposure to salt fog followed by 24 hours drying time – ideal for surfers, beach lovers or those who left their hearts and phones in San Francisco. Best of all, Torque combines the best ruggedized features from Kyocera’s highly successful Dura Series of ruggedized devices with an Android 4.0 (Ice Cream Sandwich), LTE smartphone. Torque features include a 4-inch WVGA (800 x 480) LCD IPS capacitive touchscreen with ruggedized, impact-resistant glass for added protection from scratches and cracks, a long-lasting 2,500mAh Lithium Ion battery and Swype for rapid text entry. It has a snappy MSM8960 1.2GHz Qualcomm Snapdragon® dual-core processor, 4GB ROM/1GB RAM memory, and supports microSD™ memory card expansion up to 32GB. Take advantage of 4G LTE speeds and the speedy processor with unlimited data. Sprint is the only national carrier with Truly UnlimitedSM 4G LTE data, text and calling to any mobile with no metering, no throttling, and no overages while on the Sprint network. Torque is the first U.S. device to feature Kyocera’s proprietary Smart Sonic Receiver technology, which eliminates the need for a traditional speaker in a handset, instead using vibrations to transmit sounds directly to the eardrum with unparalleled sound quality. Building on Kyocera's 53-year heritage in advanced ceramics, the new technology uses a Kyocera ceramic actuator to turn sounds into vibrations. It uses twin paths to transmit those sounds to the user: traditional sound waves and vibrations that are carried by body tissue directly to the eardrum and inner ear. The technology received multiple “Best of” awards at the wireless industry’s largest U.S. trade show, while editors at Popular Science magazine found the technology "worked so well – and so imperceptibly – that it eliminated the need for a conventional speaker altogether." Mobile payments are enabled by Near Field Communication (NFC) as well as Wi-Fi (b/g/n), Stereo Bluetooth®(4.0 + LE/EDR) wireless technology support and high-speed USB 2.0. Torque's 5MP rear camera and 1.3MP front camera are enhanced with features such as panorama, high dynamic range, facial recognition, smile/blink detection and burst mode. The rugged handset also includes Kyocera’s Eco Mode proprietary battery management software to monitor and conserve battery power, as well as MaxiMZR, a new software tool to save power by blocking background data connections for always-on nonessential apps. Sprint introduced its all-new 4G LTE network in July 2012 and now offers service in 58 markets.3 For the most up-to-date details on the Sprint 4G LTE portfolio and rollout, please visit www.sprint.com/4GLTE. For detailed 4G LTE maps, providing coverage information right down to the address, please visitwww.sprint.com/coverage. Customers are encouraged to check back often, as the maps will be updated when coverage in these markets is enhanced.